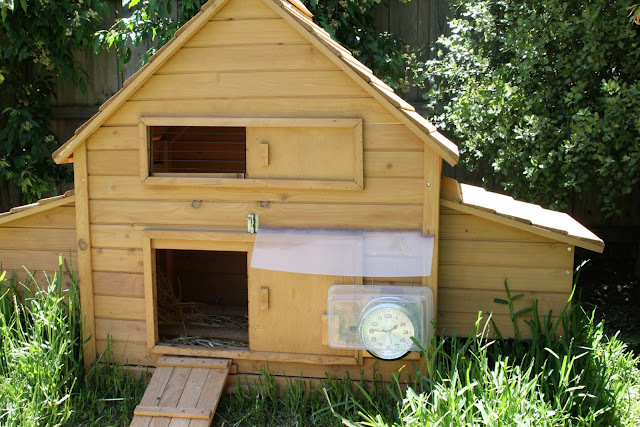 Our chicken coop has a sideways opening door - this design could be applied to a vertical opening door. My plan was to use an alarm clock as a timer to trigger opening of the door. I found a suitable (cheap) clock at a home wares store. My requirements were simply that it was battery operated, and had a mechanical alarm - that is, it must physically ring bells. I assumed I could modify the mechanical mechanism to release a spring loaded door. On opening the clock, I find that it uses a motor with an off-centre axle to actuate the bell ringer. 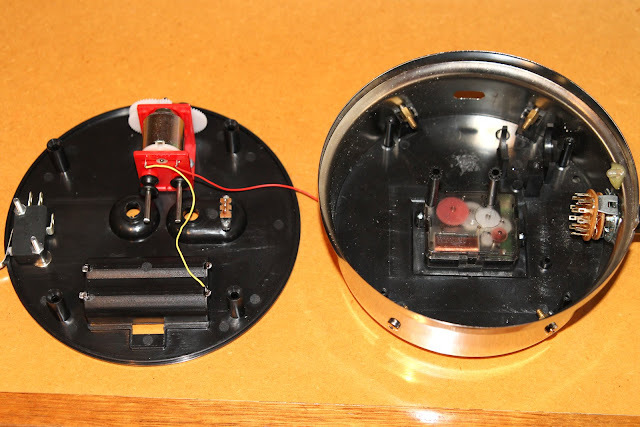 The alarm clock used two 1.5V AA batteries, one was for the clock, the other was used to drive the alarm motor (obviously switched by the alarm activation). Since there was switched power source, maybe I could replace the motor with a solenoid. It turns out that the available solenoids (e.g. this one) require a higher voltage (12V) and this would complicate things. Instead I decided to go with a motor, and have it pull the door open using a string. The existing motor was suitable, but would require a gearing system to reduce the speed and increase torque. 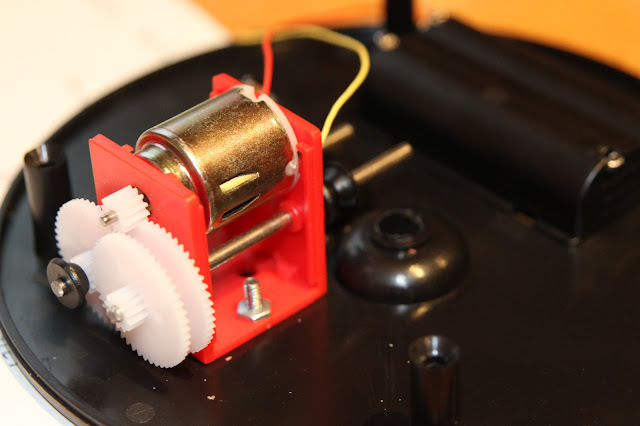 The gears I found already include a motor - which coincidentally is exactly the same model. Apparently it can operate at 3V or 1.5V - so I have the option of putting the batteries in series if I require more power. I decided with a bit of re-engineering the clock body could be used to house the automatic door opener. Here's the motor and gears attached to the back panel of the clock (note the gearing ratio needed some later mods). The alarm clock rings the alarm for a very long time (an hour or so), and normally you would manually switch the alarm off. I'll add a micro switch to stop the motor once the door has opened fully. This shows the micro switch attached to the back panel. That will cover opening the door, but how do I close the door. Due to the motor gearing it will be near-impossible to physically close the door. Instead I'll add a switch to reverse the motor. Taking it further, I add a three position switch, with manual open, close and auto (open) positions. This photo also shows the opening for the micro switch, and the door string. Now it was ready to be wired up, here's the before and after shot. Not exactly neat, but it works. 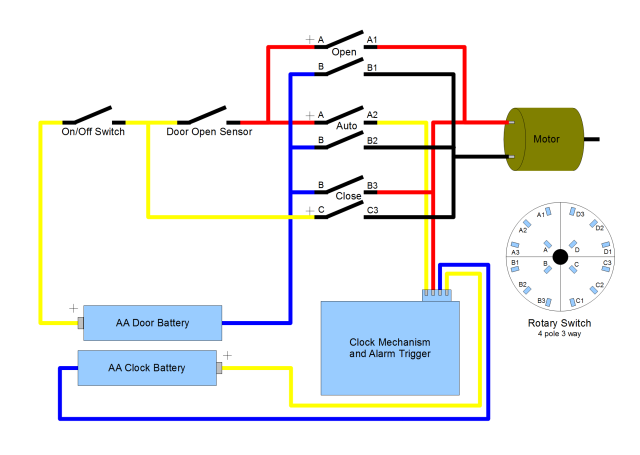 Here's a circuit diagram showing what I've done - click to access a PDF version. 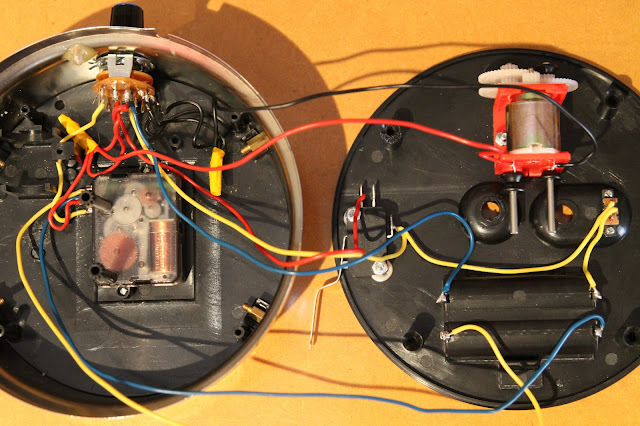 Update 5/9/10: The diagram now shows the wiring of the rotary switch. 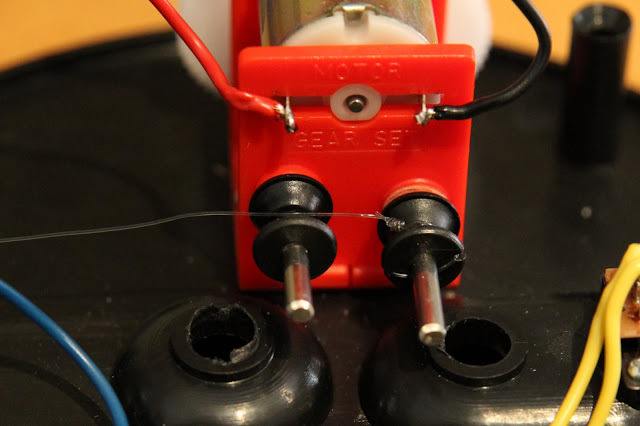 Now I attach a fishing line to the motor (after referring to fishing web sites for instructions on tying knots). I also modify the gearing ratio since the string was being pulled too fast. 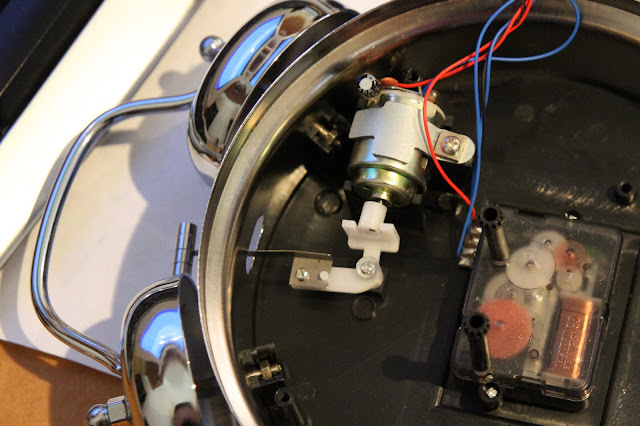 When the micro switch activated to stop the motor, there was too much travel and the switch would have been damaged. 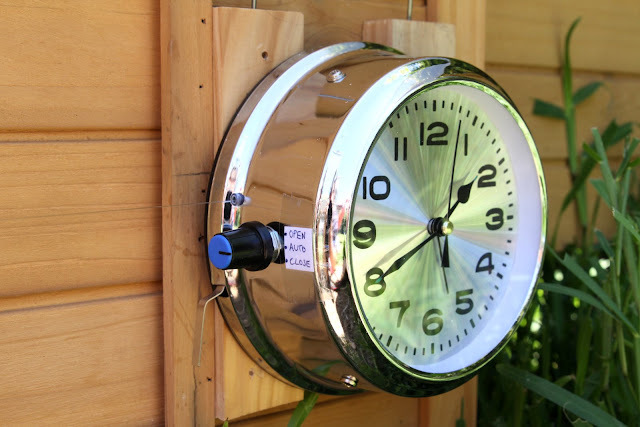 This image also shows mounting holes that will be used to attach the clock to the chicken coop. 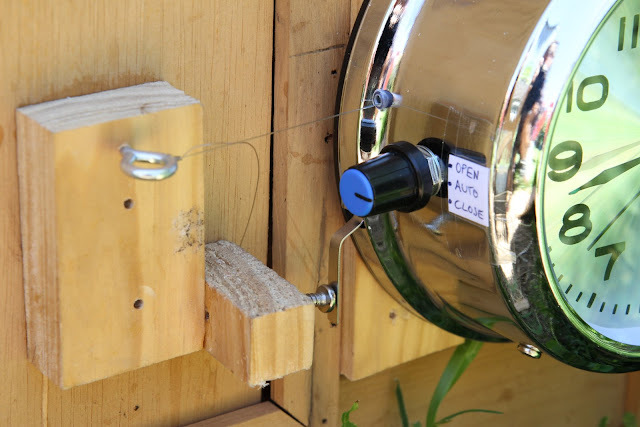 This shows the door opener attached to the front of the chicken coop. 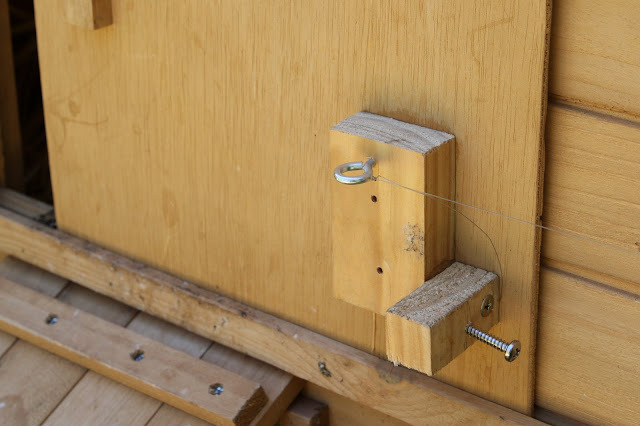 The string attaches to the door as shown. I've also got an adjustable screw to press the door stop micro switch. This shows the door stop activated. 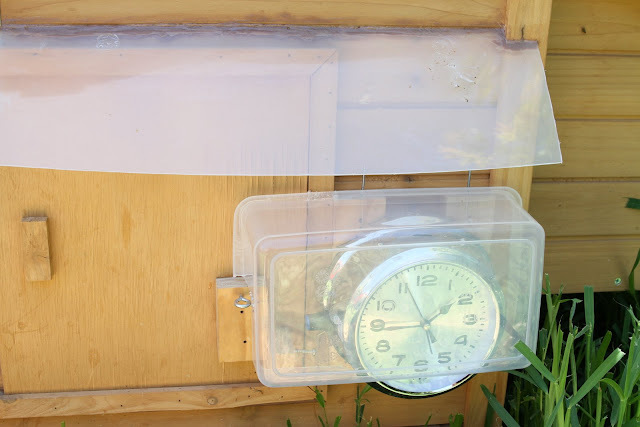 To protect from weather, I've modified a plastic container to fit snugly around the clock. 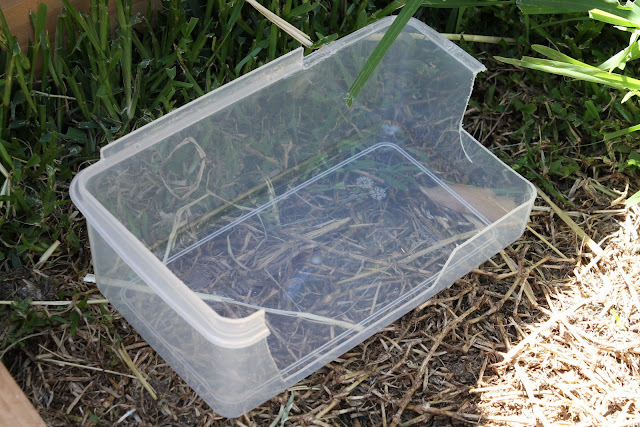 I've also added a large shield to prevent water getting down the back, or through the holes I use to mount the plastic container. Here's the completed door opener. This video shows the door opener active. 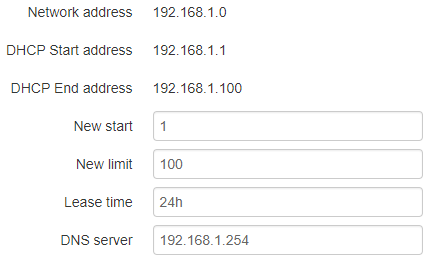 I'm starting it manually here, but under normal operation it will be triggered by the alarm timer. We've currently set the door to open at 5:30AM. We did an investigation shown in the following video and found that the chickens are waking before 5AM - when it is still very dark. They don't seem too fussed with being forced to sleep in a bit longer. They also don't mind the sound of the motor. Update: The wooden door frame has been replaced with aluminium to reduce the sliding friction (and avoid risk of the door expanding due to rain). I also intended to replace the door with a plastic one, but have not yet done so. The wooden door seems to slide alright, even with the dirt and muck that can collect there. This photo also shows how I've spring loaded the door. This reduces door bounce when opening, plus helps when closing the door. The springs are only light, since I don't want to strain the motor. Battery life seems good so far, with 2 months on the same battery. Update 1/4/10: I've replaced the first AA battery after almost 4 months of operation. The battery wasn't flat, I just didn't want to risk it not opening in the morning. Of course, I've only replaced the door motor battery, the clock is operating on the other battery. Update 12/6/10: This chicken coop has now been replaced with a larger one. We're still using the same automatic door opener however it now operates vertically, see this posting for more details. This might be a stupid question, but how exactly does the door close? Do you just switch it to the "close" mark and then it unwinds as you physically close the door with your hand? I am going to show this to my DH. I hope he can make me one. 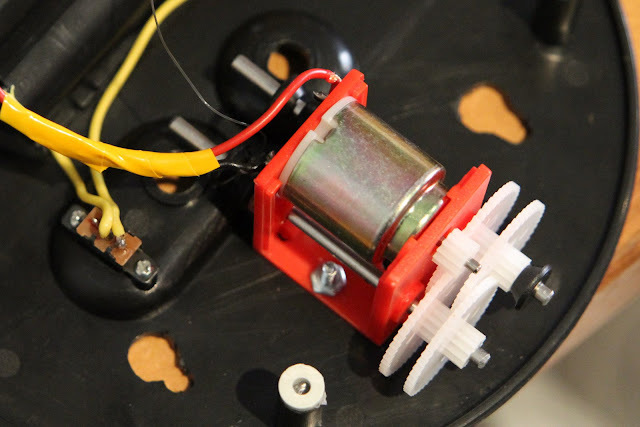 @SheltonDHW: The Close position just reverses the motor unwinding the string. You need to pull the door across (and avoid the string tangling up). I've added a spring which will pull the door closed, but it takes some tweaking to get the tension right. Enough to close the door, but not too much to drain the battery when opening. 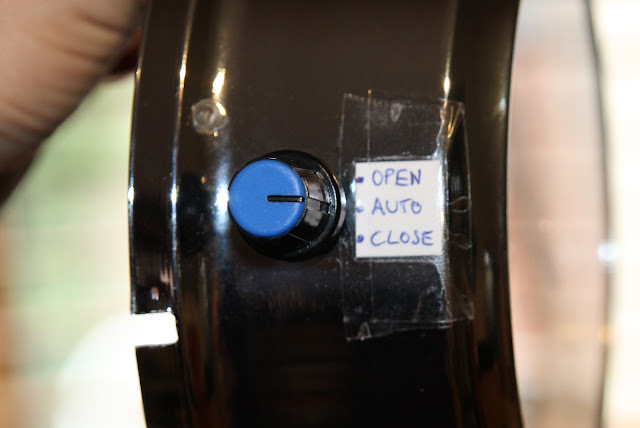 Note the when closing the door you have to manually switch it back to Auto since there is no sensor to stop the motor. Makes sense anyway, because the door will then automatically open the next day. I'll add more details when I complete my tweaking. Cool, looking to do the same. Hoping to rig a solar panel with a sealed lead acid battery, and use photocells to trigger the events. I was leaning towards a homemade pneumatic actuator with a portable 12V air compressor, but your solution seems a lot easier. Hi Mark - great blog. I really appreciate your descriptions and pics. Thanks. Do you have any problems with the bottom track building up with krud that stops the door movement? I had designed an automatic door several years ago and I encountered lots of problems with the bottom track. Straw, grain, mud, poo, and moisture led me away from my design. For horizontal sliding doors I will design a top-track design. @Sharon and Larry: The motor can pull the door through the crud (even though it is not very powerful). I have also replaced the door frame with Aluminium to reduce the friction. I've added a photo showing this. hey good job with the automatic chicken coop door opener design. I like how you've made it fairly water resistant too, wonder if the chickens play with it much? Thanks for the info. This is excellent Mark.I am trying to build one, could you please advise me on the three way switch pin numbers on the circuit diagram? I am using a 4 pole 3 way rotary switch. Your help will be appreciated very much. @Naz: I didn't think anyone would be crazy enough to make one. I've updated the PDF wiring digram to show the connections for the rotary switch. It sounds like you've got the same switch. You'll need to use 3 poles, (A) for the switched positive, (B) for negative and (C) for the positive. The numbers 1-3 correspond to Open, Auto and Close positions. It pays to have a multimeter available. It took me 3 goes to wire it correctly - probably due to poor choice of wire colours. I hope it works out for you and you're chickens. You are a mechanical genius. Unfortunately even with your great directions... I'm not. Mark....you are a clever so and so aren't you...I'm really impressed with your design...I have searched high and low for a horizontal door opener for sale in the UK..not one!! Good idea and great write up, must say I'm impressed. I wonder, do you have any idea what ratio the gearbox you used was? I've seen gearboxes with ratios ranging from 27:1 to 200:1. Might have a go at this myself if I get time! @George: The final ratio is 256:1. I guess you need to be flexible based on the size of your motor versus the weight/friction of the door. The gearbox I used, could be configured with from 1 to 6 gears. So the final ratio would range from 4:1 to 4096:1. This is great. Does it also close automatically after sunset? I have a coop with 9 hens and predators who come to eat them in the night. So I am looking to make something that also closes automatically at night (maybe 1 hour after sunset or something like that). @Srinath Alapati: In my configuration it only opens the door. Ultimately the restriction is that a alarm mechanism only activates once a day. 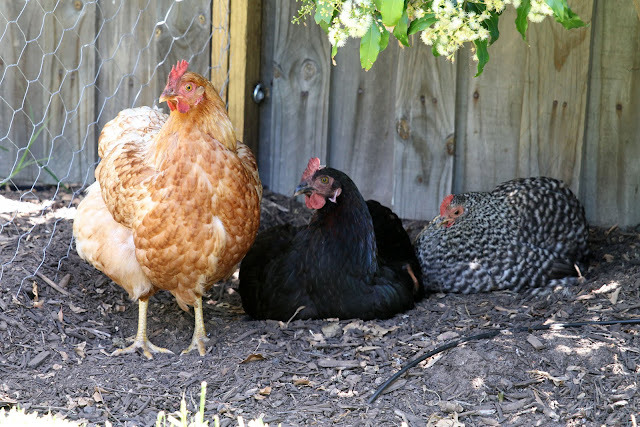 You could use the alarm to automatically close the door - and get up each morning to let the chickens out. Alternatively there are electronic chicken door controllers on eBay that will open and close. 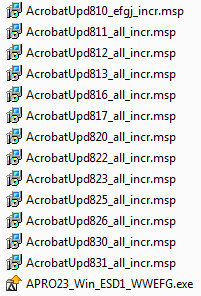 They are much cheaper now than when I originally did this project. I have a similar design. I have some photos as well. Could I email them to you. I can't find a gear motor head that would lift or pull pounds. Thanks for sharing the impressive steps and videos on how to build automatic chicken door openers. The ideas will help many people to keep their chicken comfortable and safe without investing in expensive equipments. We are excited to put this together and need a little bit of help. 1. What brand and model clock did you use and where did you buy it? 2. 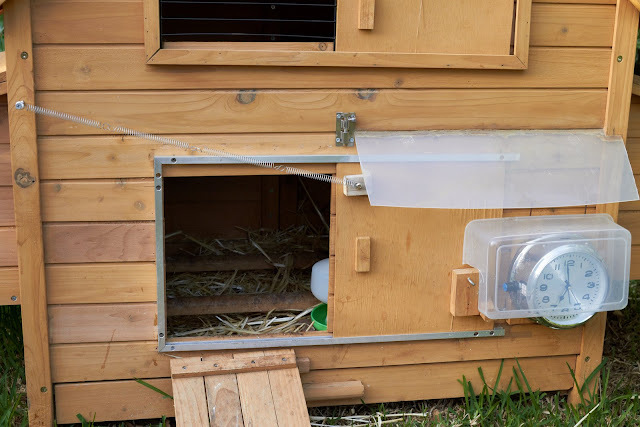 Did you ever figure out how to make it open AND close the coop door? Would it be possible to rig up a second clock to pull the door closed? Would it be possible to add a second clock to pull the door closed?